4.5 billion years ago, long before Homo habilis first picked up a pointed stone and used it as a tool, something truly spectacular occurred that would change the space around it forever. The Sun was born! Imbedded in a fluffy cloud of gas and dust compressed under its own gravitational pull the core of the Sun burst into existence igniting a fusion reaction that would and will continue to fuel it for over 10 billion years. At the start of its life a star rotates very quickly, while there is no way to really know how fast the Sun's early rotation rate was the impact that it would have had on the surrounding disk is also hard to determine. We do, however, know that over time a star will loose its angular momentum through outflows and winds reducing its angular rotation over time, or 'spinning-down'. Using a technique called Gyrochronology we can estimate that at the age of 100 million years the Sun would have been rotating over 10 times its current ~25 day rotation period, so we can only assume that in the lifetime of solar system formation or disk dissipation the Sun had a much faster rotation rate. This large rapidly rotating mass at the center of the cloud spins the material surrounding it causing it to flatten into a disk – like spinning out a pizza base from a ball of dough. By observing other pre-main-sequence stars and measuring the dust emission in the infrared and mm wavelengths we can estimate what the Sun might have looked like shrouded by its protoplanetary disk. 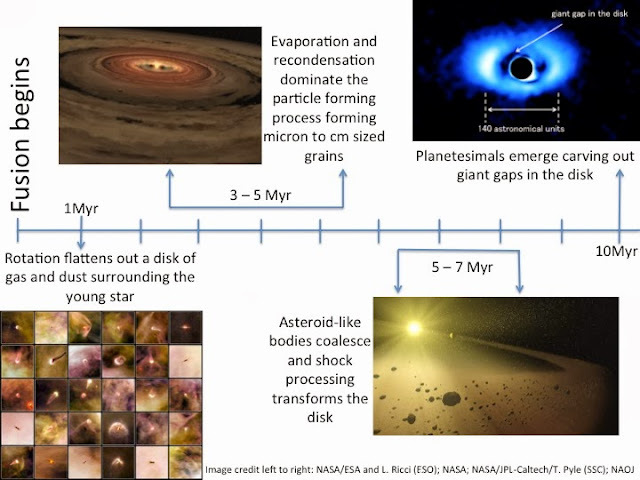 From observations it is estimated that it takes around 7-10 million years for the protoplanetary disk to dissipate potential forming a planetary system invisible to our current instruments. First the gas and dust of the disk condense to form micron-sized particles, 100 times smaller than the thickness of a sheet of paper, to cm sized oxide and silicate grains. Over the next few million years evaporation and recondensation will be the dominant process in the disk. From studies of meteorites and asteroids it is estimated that this high-temperature nebula process lasted between 3-5 million years before larger asteroid like bodies formed. These asteroid-like bodies would have then later formed bodies capable of retaining their own heat or substantial radioactive material. 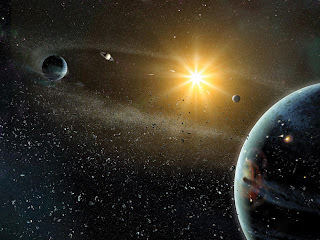 Over the next 2-3 million years through collisions and gravitational interactions planetesimals emerged. Followed by a chaotic period of ‘shock processing’ or ‘heavy bombardment’ where the material fought its way into stable orbits or was chucked out of the solar system entirely – potentially forming some of the comets that come back to visit their original home every few hundred years. Theoretical models of protoplanetary disks to early solar systems help us understand how material is likely to behave within the disk and the likelihood of forming planetary systems that are stable like our own. With the discovery of such systems over the last few decades an increased effort has been applied to such simulations to determine if we really are the exception to the rule, which thus far appears very different to our own. The nature of the very early solar environment is still largely a mystery but scientists are working with renewed vigor from analysis of meteorite to observations and simulations of young protoplanetary disks. In an effort to answer the question; where did it start and how did we get here? Title image: ART BY DANA BERRY; SOURCES: HAROLD LEVISON AND DAN DURDA, SWRI.